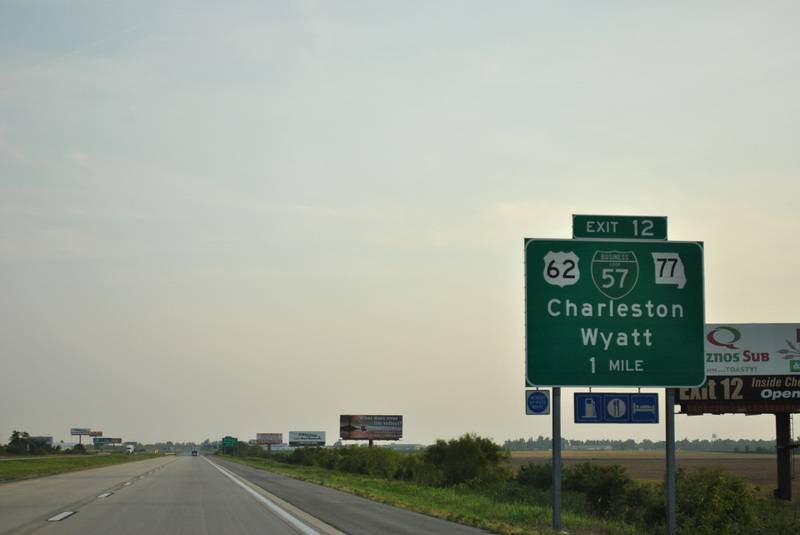 Interstate 57 has a single business loop in southeastern Missouri. One could easily be considered along the 364 mile corridor through Illinois along old U.S. 54 or parallel IL 37 through southern reaches of the state. 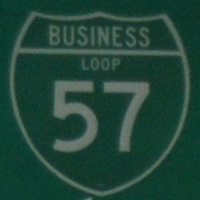 The lone entry for Business Loop I-57 comprises a 2.92 mile route through the Mississippi County seat of Charleston. Cosigned with Missouri 105 along Main Street, the business route leads north from Exit 10 to U.S. 60 & 62 (Marshall Street) at the city center. U.S. 60 & 62 overlap with Business Loop I-57 east back to the freeway at Exit 12. The route is well marked. U.S. 60 & 62 approach the diamond interchange with Interstate 57 on the east side of Charleston. Business Loop I-57 begins here. Photo taken by H.B. Elkins (06/00). Sign changes made here include replacing the U.S. 60 shield with a U.S. 62 marker and adding an up arrow in place of the right arrow for I-57 north to Illinois. One mile ahead of the south end of Business Loop I-57 (Exit 10) on I-57 north. 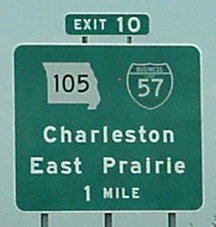 This sign was replaced by 2007, but still with a centered exit tab. Photo taken by H.B. Elkins (06/00).